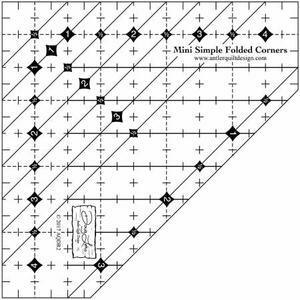 Mini Simple Folded Corners Ruler av Doug Leko från Antler Quilt Design. Designed for Miniature Enthusiast! Use for base fabrics that are smaller than 4-1/2in (what you will be adding a folded corner to). Use with any pattern calling for folded corners. Remarkably accurate! Never draw a line for folded corners again! Seven different sizes to choose from, 1/2in to 3-1/2in finished folded corner. Choose between two methods: exact size folded corners with no trimming needed OR oversize folded corners that are trimmed down. Easy to read ruler. No matter what shape you are adding a folded corner to (square, rectangular, triangle), Simple Folded Corners can add them with ease! Step by step instructions included with the tool. Illustrations for both LEFT and RIGHT hand trimming.